US Social Security Administration, "Social Security Death Index", database, American Ancestors, "Donald M Sackett, b. Mar 13, 1919, d. Aug 12, 1971, SSN 559-01-5835 issued CA, residence unknown." "US Department of Veterans Affairs BIRLS Death File", database, Ancestry.com, "Sackett, Donald, b. 13 Mar 1919, d. 12 Aug 1971." 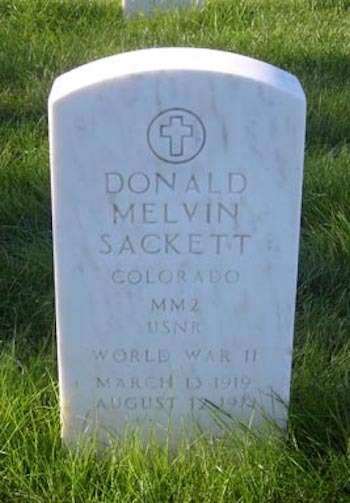 "U.S. Veterans Gravesites", database, Ancestry.com, "Sackett, Donald Melvin, service info: MM2 US Navy World War II, b. 13 Mar 1919, d. 12 Aug 1971, interment 19 Aug 1971, Ft Logan National Cemetery, Denver, CO, section R site 2275." "California, County Marriages, 1850–1952", digital image, FamilySearch, License & certificate, "21 Feb 1946, Long Beach, California, Donald Melvin Sackett, of 1060 Newport Avenue, Long Beach, 26, 1st m., b. Frisco, Utah, mechanic, S & S Plastic Co, father Frank Sackett b. UT, mother Etta May Ellison b. UT; to Beatrice Eugene Kelley, of 1941 Walnut Ave, Long Beach, 22, 1st m., b. South Dakota, secretary, Union Plastics Co, father Sterling Kelley b. IL, mother Mable F Butts b. Nebraska. By John H Peters, Pastor St Paul Luth Ch." "U.S. Social Security Applications and Claims Index, 1936–2007", database, Ancestry.com, "Sackett, Beatrice Eugene, b. Stickney, Aur, South Dakota, 4 Mar 1923, d. 26 Feb 1998, father Sterling Kelley, mother Mabel F Butts. Listed Oct 1940 as Beatrice Eugene Kelley. Listed Feb 1954 as Beatrice Eugene Sackett. Listed Jun 1956 as Beatrice Eug Gillespie. Listed 11 Mar 1998 as Beatrice E Gillespie." "Obituary Daily Times Index", database, Ancestry.com. "US City Directories, 1822-1995", digital image, Ancestry.com, Long Beach, California, City Directory, 1941, "Sackett Donald r1450 Coronado av. "; 1942, "Sackett Donald driver r606 Molino av. "; 1948, "Sackett Donald (Beatrice) carp r1941 Walnut av." Bellflower, California, City Directory, 1950, "Sackett Donald M (Beatrice) carp h8529 Rose." Norwalk, California, City Directory, 1953, "Sackett Donald M (Beatrice E) carp h14308 Cameo."